Timoteo Alejandro Ramirez and his wife Cleriberta Castro were found dead in their home today, according to San Juan Copala’s blog. Contralinea reports that the perpetrators are “hitmen from MULT,” the Movement for Triqui Unification and Struggle. Neighbors saw an armed commando that they say works for MULT in the area around the time of the killing. Ramirez was a “natural leader” of the Yosoyuxi neighborhood, which forms part of the autonomous municipality of San Juan Copala. According to indigenous customs, “natural leaders” are those who don’t propose themselves as leaders; the community chooses them because of their long record of community service. San Juan Copala declared itself autonomous following the 2006 peaceful uprising that nearly overthrew Gov. Ulises Ruiz Ortiz. It threw out all political parties and organizations and governs itself through traditional indigenous governance, known in Mexico as “uses and customs.” The autonomous project initially enjoyed support amongst the rank-and-file of some of the political organizations that operate in the zone. However, some organizations’ leaders, concerned that they would lose power if the autonomous project moved forward, actively and violently opposed the project. Those leaders who supported autonomy were quickly replaced by people who were sympathetic to the political parties. San Juan Copala made international headlines last month when alleged members of the Union for the Social Well-being of the Triqui Region (UBISORT) opened fire on an international aid caravan headed to the besieged community. Mexican social leader Bety Cariño and Finnish observor Jyri Jaakkola died in the attack. The caravan was bring food, clothing, water, and medicine to San Juan Copala, which UBISORT paramilitaries have blockaded since January. No one can enter or leave the community, and the paramilitaries cut off electricity and running water. The intense international outrage that followed the caravan attack did nothing to stem the violence. Two weeks after the attack, UBISORT paramilitaries kidnapped six Triqui women, five children, and a baby when they snuck out of Copala to purchase food in the market of the nearby town of Juxtlahuaca. The Oaxaca state government and the Oaxaca State Human Rights Commission refused to accompany the woman back to San Juan Copala to ensure their safe passage. San Juan Copala has called for a second, larger international caravan to the autonomous municipality on June 8. First photo: Courtesy of Contralinea. Second photo: by Heriberto Rodriguez. 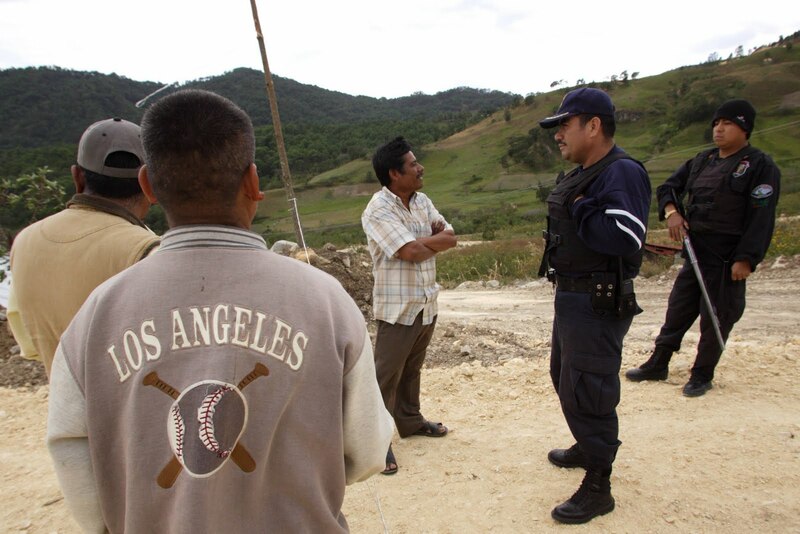 Timoteo Alejandro Ramirez talks to Oaxacan state police. On February 12 the Abejas Civil Society Organization of Acteal extended an invitation to a march they are organizing to mark International Women’s Day on March 8. 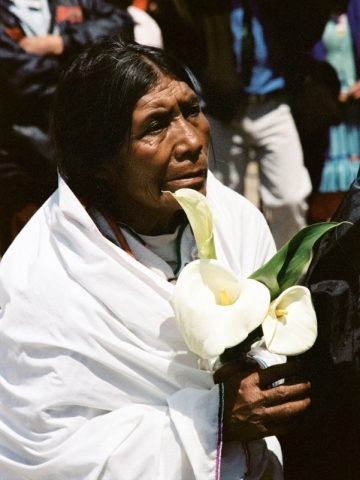 The Abejas commemorate the Acteal massacre on the 22nd of each month. This past February 22, the Abejas published a press release in which they shared their analysis of the current situation in their municipality, in light of the recent release of several prisoners accused of the massacre. They also remarked on conflicts taking place in other parts of the state. Juan Manuel Martinez Moreno is free! As we reported in our January 2010 Chiapas/Zapatista News Summary, 57 residents of Agua Azul ejido, belonging to the PRI (political party) and suspected of belonging to the Organization for the Defense of Indigenous and Campesino Rights (Opddic, its initials in Spansh), entered Bolón Ajaw Zapatista community on January 21, smoking marijuana and displaying guns. The “Opddicas,” as they are referred to by the Zapatistas, constructed 3 cabins on Bolón Ajaw’s recuperated land. There is a long-standing history of violence and provocation by the PRI members from Agua Azul ejido in this region. The conflict is about controlling the land. While the PRI members have no legal right to Bolón Ajaw’s land, the Mexican Army and the state government allow them to use any means they see fit to try to take the land away from the Zapatistas. What makes this land so desirable is the spectacular turquoise waterfall located on Bolón Ajaw’s land, located adjacent to the internationally famous tourist attraction, the Agua Azul Cascades (shown above). The PRI members know there is a lot of money to be made from tourism and want to expand their control of the tourist area into Bolón Ajaw. That coincides with the state and federal governments plans for a mega-tourism corridor between Agua Azul and the Palenque Ruins, a majestic Maya archaeological site. As the governments’ plans for developing the region have become known, entry fees collected from tourists have been the cause of numerous clashes between PRI members and Zapatista supporters in the region of the Agua Azul Cascades. The government has promised the PRI members a cut of the profits if they displace the Zapatistas who do not want to make the land part of a tourist project, but want to preserve the natural setting, including the virgin waterfall. On February 6, armed conflict erupted in and around Bolón Ajaw. According to the government, the end result was 1 PRI member dead from a gunshot wound, some 20+ PRI members injured, many from gunshot wounds, and 7 PRI members detained by the Zapatistas. As if on cue, the PRI members went running to the Attorney General of Chiapas claiming that the Zapatistas mounted an armed attack on them. The Attorney General found it convenient to believe the PRI members and issued press statements accusing the Zapatistas and demanding immediate release of those “kidnapped” (detained). The Zapatista Good Government Junta in the Caracol of Morelia issued a long state-ment describing and denouncing the incident. The Junta first reminded us that after the January incident in Bolon Ajaw it warned that the Zapatistas would defend the land and its riches. It went on to state that it was the armed Opddic members from Agua Azul ejido who ambushed unarmed Zapatistas and, therefore, it was the armed PRI members who shot wildly and killed one of their own members. 3 Zapatistas were injured by bullets, one gravely. The Junta reported that all those detained were released. The Junta made a proposal as a basis for dialogue between the parties. The government, however, is insisting that the dialogue be held at the Government Palace in the capital city of Tuxtla Gutiérrez and that Governor Juan Sabines be present to preside over the dialogue. Moreover, the government insists on the presence of a Zapatista from Bolón Ajaw. And, what worries everyone is that government officials are insinuating that if the Zapatistas do not go to the Government Palace, the Army will enter to resolve the problem militarily. The implications of this are ominous. A truce between the federal Army and the Zapatista Army has existed ever since the 1995 passage of the law promoting peace and dialogue in Chiapas. This has kept both the federal Army and the Zapatista Army from using their weapons. If that law and the truce were deemed broken, the Mexican Army could enter into Zapatista communities to detain people, destroy autonomous institutions (government headquarters, schools, clinics, economic projects) and occupy the communities. Because the state government set such ridiculous conditions for dialogue, the Morelia Junta believes that this is what President Felipe Calderón wants to happen. The Fray Bartolomé de las Casas Human Rights Center (Frayba) acted as a “communications bridge” between the government and the Junta, delivering messages back and forth. Frayba issued a statement saying that dialogue was not possible now due to the intense military presence in the zone around Agua Azul and the conditions set by the government. As of February 16, a “large number” of intelligence agents are reportedly operating in the Agua Azul region, some in plain clothes; military helicopters are flying low over the communities; and security forces are stationed in the area, patrolling constantly. Elder Indigenous woman takes part in march for world peace in San Cristobal, Chiapas, Mexico. The Indigenous Peoples’ march was led by Bishop Felipe Arizmendi on March 14, 2003, days before the U.S. began its “official” bombing of Iraq. This photo is relevant today for many reasons. Next month is the 7th anniversary of the U.S. invasion of Iraq and even though that war has slowed down, the attack on Afghanistan intensifies. This photograph was also taken just after an emergency delegation went to Chiapas regarding forced evictions of Indigenous communities from the Montes Azules Biosphere Reserve in the Lacandon jungle. Today in Chiapas, there are violent evictions taking place in the Lacandon jungle–this time to make room for oil palm plantations. In March 2003 Orin Langelle travelled to Chiapas on an emergency investigative delegation to look into threatened evictions of Indigenous communities from the Lacandon jungle, and to examine the level of ecological destruction there. Some communities were already relocated. The delegation, including journalists, photographers and organizers, visited threatened communities in the Lacandon, met with organizations working in the region and conducted overflights of the jungle, documenting the ecological damage. Why the evictions? Conservation International (CI) teamed up with the Mexican government to declare that Indigenous communities, including Zapatista support base communities living in the Monte Azules Integral Biosphere Reserve were destroying it. This provided a supposedly ecological pretext–protection of the Monte Azules–as the reason for evicting these communities. Our delegation proved that most of the communities had been conducting sustainable organic agriculture in the jungle for years. They outlawed slash and burn farming and practiced regular crop rotation to protect the soil. In fact, we found that it was the military that was causing massive destruction of the rainforest–which we witnessed on our overflight of the jungle. This developed during the Mexican government’s thrust to push the Plan Puebla Panama mega-development scheme. One of the PPP plans calls for the establishment of new timber plantations in the region. What follows is a communiqué from the Latin American Network against Monoculture Tree Plantations (RECOMA) reporting on the violent situation that local communities and Indigenous Peoples of the Lacandona forest in Chiapas are presently going through. Appeal to international solidarity to protect the Lacandona Forest in Chiapas (Mexico), February 2010. The Latin American Network against Monoculture Tree Plantations (RECOMA) is hereby denouncing the arbitrary treatment suffered by various communities in the Lacandona forest, in the area declared as the Montes Azules Biosphere Reserve, in the State of Chiapas, Mexico. Last January, the Chiapas State Congress approved funding for the construction of a palm oil processing plant. Shortly afterwards, dozens of families from the Municipality of Ocosingo were evicted from their territory, in order to give way for the expansion of monoculture oil palm plantations. Dozens of heavily armed police arrived in helicopters and with aggressive violence evicted men, women and children from their homes, which they then burnt down and with no explanation, removed the community to the city of Palenque. While the government talks about conservation and protection of the zone, it evicts those who have been truly responsible for making this conservation possible. At the same time, it replaces local ecosystems by oil palm monocultures. Oil palm plantations are being promoted under an “ecological” mask, as if the production of agrofuels based on palm oil could be a solution to climate change. Apart from the falsehood of these affirmations, no mention is made of the serious negative impacts they generate such as violation of the local population and indigenous peoples’ human rights, as is presently the case in Chiapas. Furthermore, monoculture oil palm plantations are one of the main causes of deforestation and therefore contribute to climate change through the release of carbon stored in the forests, while destroying the means of subsistence and food sovereignty of millions of small farmers, Indigenous and other communities, and generating serious negative environmental impacts. The plantations require agrochemicals that poison the workers and local communities and contaminate soil and water. Monoculture oil palm plantations eliminate biodiversity and deplete fresh water sources. In sum, monoculture plantations for the production of paper and agrofuels (such as in the case of oil palm) worsen the living conditions and opportunities for survival of the local population and are only beneficial to a small handful of companies that become rich at the expense of social and environmental destruction. For this reason, we are appealing to the international community to condemn the plans for the expansion of monoculture oil palm plantations in Mexico, denouncing this situation by all means at your disposal. Follow us on Twitter: http://twitter.com/Climatejustice1. “Whirlwind of our Words”, Morelia, Chiapas, Mexico. We the Council of Good Government denounce and clarify what happened on the Saturday 6th February 2010, on the land controlled by the village of Bolon Ajaw, autonomous municipality Comandanta Ramona. The provocateurs, members of OPDDIC, inhabitants of Ejido Agua Azul, aggressively came onto the land where our companeros and companeras live, in order to work there on Thursday 20th January 2010. In order to make the situation clear to the public, regarding the new phase of aggression restarted against our companeros “bases of support” (Zapatista community members) of the autonomous municipality Comandanta Ramona, by OPDDIC members; we made public our position regarding the defence of the Mother Earth in a written declaration dated 23rd January 2010. In this declaration we clearly stated that we would defend the land and its natural resources. For those who don’t remember, you can re-read this declaration on the Enlace Zapatista website. There you will find the full names of the aggressors, how they were behaving and what calibre of guns they carried when they went onto the land; and we want to make clear that they never put these guns away, but carried them at all times while they were working on the land, and not only that we also want to make clear that they smoked rolled-up cigarettes which had really disgusting smelling smoke and smelled of marijuana. Please excuse our ignorance because we don’t really know the scope of the internet but we believe that it reaches all the corners of the world and we believe that when we publish something online, like for example our declaration, it reaches all the parts of the world, and we don’t believe that the bad governments don’t have computers nor access to the internet in order to be able to read about what we denounced. We assume that the bad governments have these tools in order to find out what the people who they control, by giving them a few crumbs off the table, are doing. In front of the world’s eyes, the bad governments did nothing to prevent this attack that we suffered from happening – neither Juan Sabines (Governor of Chiapas) nor Antonio Moreno Lopez, Municipal President of Chilon, nor the wonderful Felipe Calderon did anything, because they use tricks to get what they want. As such we contradict what the OPDDIC leaders are saying: that our companeros took them by surprise on Saturday 6th February – this is a complete lie, because two weeks before we had published our declaration and so in our opinion this time was available for us to wait and see if they wanted to have a dialogue with us, but they never approached us. Furthermore years earlier we, the Council of Good Government, had invited Commissioner Geremias Lopez Herandez to meet and dialogue with us but he has ignored us. Our companeros went on to the Bolon Ajaw land at 6am, which is the start of our working day as campesinos (peasant farmers), in order to do some collective work on the land from which they want to evict us. We arrived at the area of land where we work at 7am and we didn’t go there to attack anyone, besides our companeros, inhabitants of the village of Bolon Ajaw are already living on the land. We reiterate that we have previously stated that we are going to put up a defence, working peacefully, so this shouldn’t come as a surprise. In order to reach the village of Bolon Ajaw we didn’t have to pass through the village of Agua Azul, you can get there going along paths through the fields. We didn’t go into Agua Azul, even by a millimetre, and the fabrication of OPDDIC accuses us of taking them by surprise, harassing them, humiliating them and repressing the boys, girls, older men and women. This is one of the first lies of Juan Sabines and his local leader accomplices. We aren’t like the bad governments that repress, imprison, and disappear indigenous people, we have suffered acts of barbarity during the governments of Ernesto Zedillo, and Roberto Albores Guillen and we never copy their injustices. But in these current times we see the restarting of these tricks, just like previous governments have done, who would make up crimes in order to justify the repression. When we were going into the land it was 6am, we were walking together along a path that goes to Bolon Ajaw and we were unarmed, while we were arriving the OPDDIC invaders withdrew and we thought that they had gone back to their houses to remain there peacefully, but it wasn’t like that. They withdrew to the place where they were building their houses and since in order to get to their houses they had to pass through the village of Bolon Ajaw, once they arrived in this village they immediately began to fire rounds towards where our companeros were and there were only five male companeros and ten female companeras and so they were unable to defend themselves. The OPDDIC members came with pistols and rifles in hand shooting towards our companeros, we estimate that they fired around 250 rounds of calibre 22, thanks to our companeros quickly retreating they were not injured and so in this way there were no deaths on our side. While our companeros were retreating they shouted to the companeros who were on the land that we were working on, to ask for their support because 40 OPDDIC members were arriving with arms in hand. Once the OPDDIC members arrived at Bolon Ajaw they went to the village church. They broke open the door and once they were inside they began destroying things like: breaking the statues of the saints, breaking the case where the Holy Eucharist is kept, and breaking the simple altar. Because of their indiscriminate shooting in Bolon Ajaw, they themselves killed their fellow OPDDIC members because they were crowded closely together while they were shooting. This is the same kind of thing that was done to us during the time of Ernesto Zedillo and Roberto Albores Guillen when the soldiers came into our villages in 1995, who scattered maize, beans, stole our chickens and looted things from our collective shop. If we remember this, it’s because we see recent events as echoes of those times. For example on 6th February 2010 our companero Manuel Jimenez Alvoro from the hamlet of Bispuyil Ja, his house was destroyed, they wrenched out the supports of his house and then they went to throw these away, then they destroyed the supporting metal rods, they destroyed the lintel, they stole the metal sheeting from his roof. These metal sheets were bought through our companero’s hard work, and bear in mind today’s high prices, the house was 7 metres by 2.6 metres and was totally demolished. As a last act of humiliation against our companero the wreckers, who belong to the PRI (Institutional Revolutionary Party) – namely Pedro Pérez Silvano, Pedro Perez Jimenez, Domingo Pérez (primero), Domingo Pérez (segundo), Melchorio Pérez Jlménez, and Pascual Pérez Jimenez – these deceitful people cut down 76 coffee plants in order to put the blame on our companero, they took these plants to present them to the Public Prosecutors office in Bachajon in order to get them to issue an arrest warrant accusing our comrade of cutting down their plants. OPDDIC’s lies say that we took them by surprise first thing in the morning, when we were the ones who were taken by surprise by being shot at, because they ambushed our companeros just a few metres away from the ticket booth for the Agua Azul waterfalls, which is staffed by our companeros from The Other Campaign. There our companero Francisco Gonzalez Gomez was badly wounded in the abdomen and fortunately is now recovering, although he had lost a lot of blood. When the OPDDIC members went to build their houses on the bolon Ajaw land they never showed respect to our female companeras. A path to the cornfield passes through the area where they were working; our female companeras were going to get or bring back maize and the lowlife marijuana smokers from OPDDIC would strip off and show the women their penises when they were passing through there. Even a dog wouldn’t do this and since the bad government\s plan is to provoke, they do this shamelessly. Once again they make up our supposed crimes, they accuse us of being kidnappers, we are the ones who are struggling against death, we are not corrupt from having millions as are the governments, as are the members of Congress, we have never done this during our struggle. We did detain seven OPDDIC members but we treated them with respect at all times and gave them food, not fancy food because we don’t have that, we gave them water, a room which wasn’t comfortable because that‘s what our houses are like, we gave them blankets – in short we respected their rights as human beings, as we would even for animals. The seven OPDDIC members who they say were kidnapped, were freed and handed over safe and sound, just as well as when they were detained; when they were freed they signed a document acknowledging that they were treated with respect. Four of the last five OPPDIC members to be set free, namely Ivan Moreno Lopez, Manuel Garcia Luna, Juan Hernandez Moreno, and Manuel Hernandez Lopez, told us that Senor Salomon Moreno Lopez was one of those who organised the provocateurs and even though we found out who he was, we didn’t harm him in any way. We are not like the bad governments who sentence people to many years in prison. We, the Council of Good Government, have never closed the door on finding a good solution to problems, we always show good will, sending our messages to the human rights activists Fray Bartholomew de Las Casas. Our proposal was that we would free the two OPDDIC members detained in Bolon Ajaw, on the condition that the following people could freely pass through : 13 members of the “Civil Protection” body (proteccion civil), 2 from the Chiapas State Government, principally Antonio Gamboa, Carlos Manuel Calvo Martinez, the director of the “Preventative Police” (policia preventiva), 2 from Fray Bartholomew human rights organisation, Jorge Armando Gomez and Pedro Faro, and an inhabitant of the community of Agua Azul: and on the condition that there be the right to free movement on the roads and footpaths for all, without distinction. In the second release of OPDDIC detainees, that is the five who were still detained elsewhere, we proposed that they be released on condition that they promise not to reoccupy the land and that peace be re-established. This was our word, and we kept it honourably and truthfully. The response of the bad government to our proposal was totally different. It can be clearly seen that the government asks for dialogue, and then replies with other things that have nothing to do with what we were discussing, and we consider that while the three aforementioned politicians continue governing in this country, they will continue with their trickery and cunning. For us it meant that the three levels of government agree that what they did to us carries on happening and that violence in all parts of our country continues. The special public prosecutor dealing with NGOs, Pedro Raul Lopez, transmitted the message from Juan Sabines Guerrero, Governor of Chiapas, that the problem should be dealt with through dialogue, but on the contrary the Governor insinuated that the army would come in and the dialogue would be broken and hostilities would resume. We believe that the intentions are already there, because we can see the movements of the military, police and PGR, accompanied by indigenous people, some in plain clothes. While we propose a solution, they respond to us with very strong threats. Comrades of The Other Campaign, nationally and internationally, don’t let yourselves be persuaded by the great lies from on high, with their violent acts and declarations full of falsehoods, as we have just experienced. People like those who call themselves governments dedicate themselves to teaching indigenous people how to deceive. Don’t be confused, you have to be able to perceive and listen to the truth. Candelaria Velasco Hernandez Angel Hernandez Perez. 1. Chiapas State Congress Passes Indigenous “Rights” Law – On December 30, 2009, the Chiapas State Congress passed a law regarding Indigenous Rights and Culture without consulting indigenous peoples in the state. This new state law conditions these rights on not conflicting with the state or federal Constitution or any state or federal law. In other words, rather than creating new indigenous rights, the new law merely reinforces the counter-reform passed by the federal government in 2001 and enforces the rights of government. 2. Cocopa Asks Chiapas Governor Not to Publish the Law – The Commission for Harmony and Pacification (Cocopa, for its initials in Spanish), met with deputies and senators who make up the local Congress in Chiapas. Cocopa’s president, Jaime Martinez Veloz, asked Governor Juan Sabines not to publish the new law on indigenous rights and culture and to consult with the state’s indigenous peoples before passing any law about them. Martinez Veloz pointed out that consultation is required by international law (Convention 169 of the International Labor Organization). 3. Human Rights Defender Receives Death Threats – Adolfo Guzman Ordaz, a human rights defender in Comitán, Chiapas, received a note slipped under the door of his home threatening him with death threat. That allegedly occurred on January 6. Earlier the same day, state preventive police had gone to his home looking for him. Their motive is not known. Guzmán Ordaz was not at home, but later that afternoon the note arrived. He had previously received a phone call on December 25 saying it would be his last Christmas. Guzman Ordaz works for the civil organism Enlace, Communications and Capacity Building (ECC, its initials in Spanish). Ministerial police broke into Guzmán Ordaz’ home last November without a warrant and terrorized his wife and small children. 4. Opddic Invades Zapatista Ejido – Bolón Ajaw is a small indigenous Zapatista village that was under siege off and on for years by its PRI neighbors in Agua Azul ejido. At some point in the last year or so, the Zapatistas reached an agreement with the state government to convert the “recuperated” land on which Bolón Ajaw sits into a legal ejido. The violent attacks by PRI members belonging to the Organization for the Defense of Indigenous and Campesino Rights (Opddic) seemed to stop for awhile. However, on January 21, 57 Opddic members invaded the new ejido (collective farm), carrying pistols, machetes and radios and began to construct 3 cabins while smoking marijuana, which is strictly prohibited in Zapatista communities. Bolón Ajaw has a spectacular virgin waterfall and is adjacent to the Agua Azul Cascades tourist area. 6. The Politics of Mining and Elections in Chiapas – On January 13, Chiapas police detained Walter León Montoya pursuant to an arrest warrant. León Montoya is a former federal PRI deputy (congressman) and is currently a representative of Canacar, a national organization of truckers. León Montoya is accused of being the “intellectual author” of the murder of anti-mining activist Mariano Abarca. The Network of Those Affected by Mining (REMA), Abarca’s organization, criticized the accusation and detention as scapegoating and a ploy to give the Black Fire mining company impunity. Curiously, or should we say conveniently, León Montoya filed a lawsuit against the PRD government of Juan Sabines over the cancellation of 2010 elections in Chiapas! His arrest apparently means he cannot pursue the lawsuit. Looks like another slick move by Governor Sabines. 1. Mexico’s “Anti-Drug” War Claims 7,724 Lives in 2009 – El Universal reported that a total of 16,205 lives have been lost since 2007, when Mexico’s president, Felipe Calderón, sent the federal Army out into the city streets to perform police functions in a war against drug traffickers and organized crime. 2. Judge’s Decision in Brad Will Murder Case Appealed – A district court judge in Oaxaca granted a protective order to Juan Manuel Martinez Moreno, an APPO member accused of the murder of Indymedia journalist Brad Will. The Attorney General of the Republic filed a timely appeal, so Martinez Moreno will remain in prison while the appeal is pending. News Summaries from previous months are now posted on our web page.